Cache files are another of those files that are created behind the scenes on your computer without you actually knowing it's happening. Many of us who are proficient enough to use a computer but not sufficiently knowledgeable as to how they function may not even be aware that our computer is producing a cache file so it is important to understand the nature of such files and also the threat they can cause to your security. What is a Cache File? If you have ever been on the Internet and visited a website and then added that website to your favourites list you will have been given the opportunity to make this website viewable when you are offline. A cache file is a copy of this website saved to your computer for use without an Internet connection. What Information Does a Cache File Hold? If you make the website available offline then the cache file will hold all of the information that was present when you saved it. It is almost like copying the website to your computer in the same way as you would with a word processing document or email. Cache files also hold information such as passwords, usernames and account numbers which you may have input when you were using an Internet Banking site. Saving this information makes it easy for you to access your account information offline but it also enables anyone proficient enough to gain access to your machine to do the same. What Else Does A Cache File Do? The other singularly most important thing a cache file does on your computer is take up space. In order for you to revisit a website offline your computer will save a copy of the site to your hard drive and retain it in a folder with a name that is usually that of the website. In essence what you are doing is copying the pages on which the website is built as well as all the audio, picture and sometimes video content that goes with it. To many who have newer computers with larger hard discs this is not much of a problem but if you have an older machine with a smaller hard disc saving such cache files can cause your computer to run slower or indeed prevent it from saving new information as space is being taken up by these cache files. Can I Delete Cache Files? Yes you can. It is important to remember however that all files contained with the directory of your operating system are erasable and a click on the wrong folder or pushing of the wrong button can cause your operating system to malfunction thus leaving your computer in a position of instability if indeed it continues to work at all. To delete cache files correctly you should go to Start Menu then Settings and then Control Panel. When you arrive at the Control Panel menu you will see an icon for Internet Options. 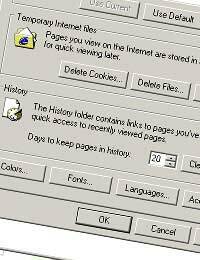 Clicking on the Internet Options icon brings up a dialogue box which asks you if you would like to perform several key functions relating to the Internet Explorer and the storing of its files. You will see here that it mentions Temporary Internet Files. The middle button gives you the option to delete files. If you click this option a new dialogue box will appear asking you if you would like to delete offline content. This offline content relates to the cache files mentioned above. You should tick this box and then press OK. Don’t be alarmed if it takes some time to complete the process because as we have mentioned some of the cache files are quite large given that they contain website data, pictures, audio and possible moving images. Solid firewall and anti-virus software will ensure that access to your computer from the Internet is made even harder for any would-be hacker or identity thief.